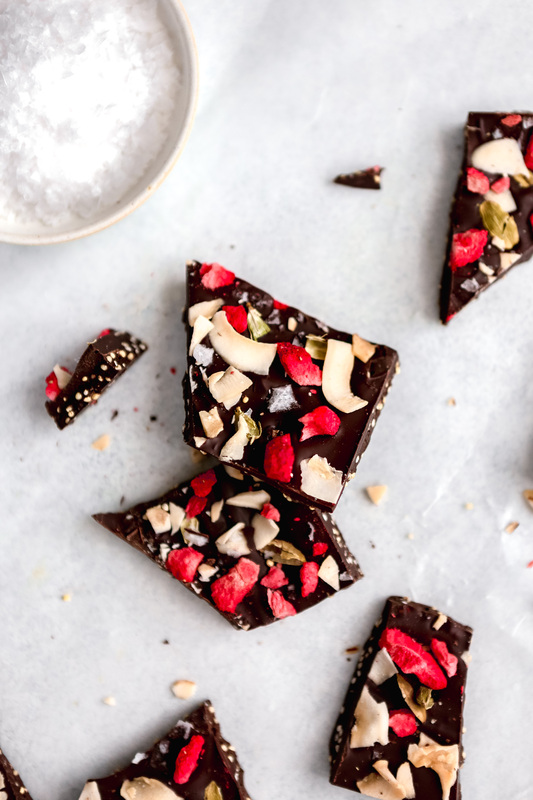 This Coconut Bark recipe reinvents chocolate bark in all of the best ways. 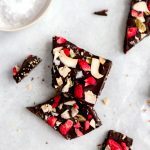 Made with quality dark chocolate and wholesome ingredients, this coconut bark has tons of texture, even more flavor and is simple to make! Let’s address the elephant in the room—what the heck is up with the millet? First off, it’s essential to use dry millet, don’t try to use cooked or popped. And secondly, the reason I call for dry millet is because it adds tons of texture, not to mention protein, fiber, vitamins and minerals. 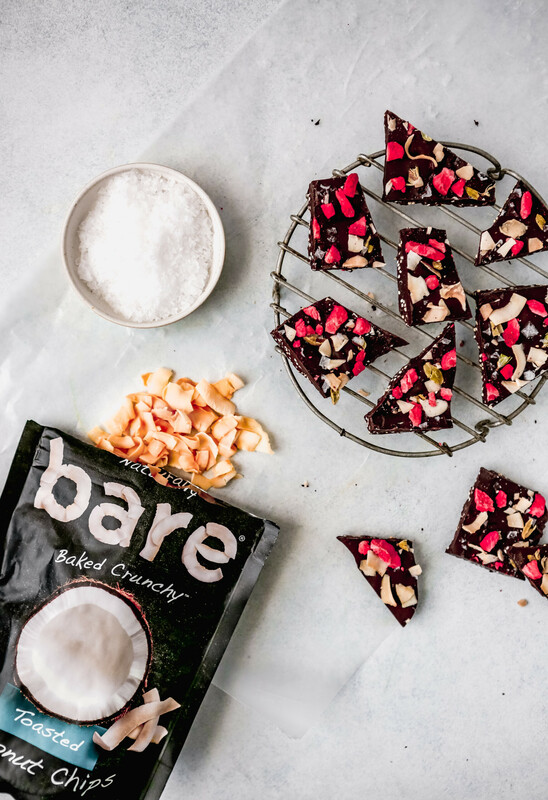 Thanks to the millet, this coconut bark has that classic Crunch bar texture. I’d say that’s a recipe for success. I also call for toasted coconut chips because they add an incredible crisp, oily texture and tons of flavor. Plus, they add quite a bit of fiber! 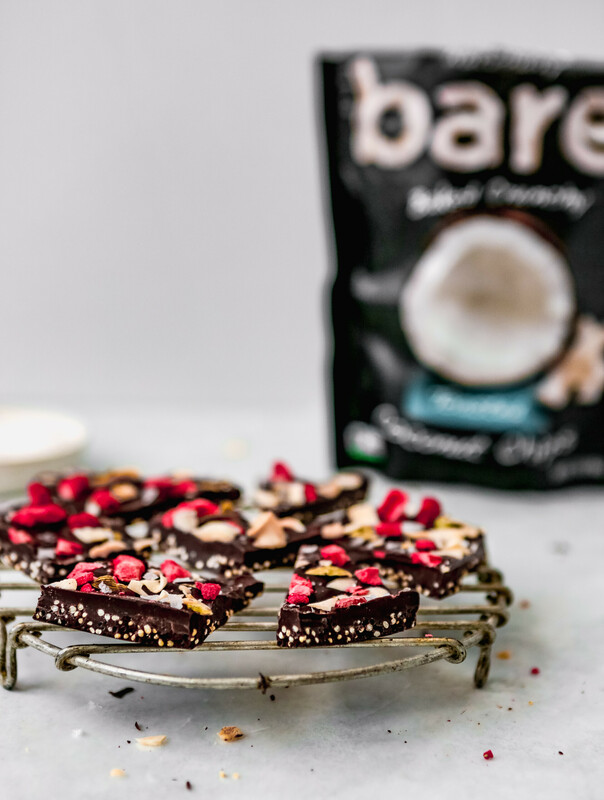 I love Bare Snacks’ Toasted Coconut Chips because they’re made with just three ingredients, coconuts, sugar and sea salt. I like to add them to fruit and nut snack mixes, granola, top avocado or ricotta toast with them, serve them with ice cream and more! However, my favorite way to eat them is straight out of the bag. They are so tasty! 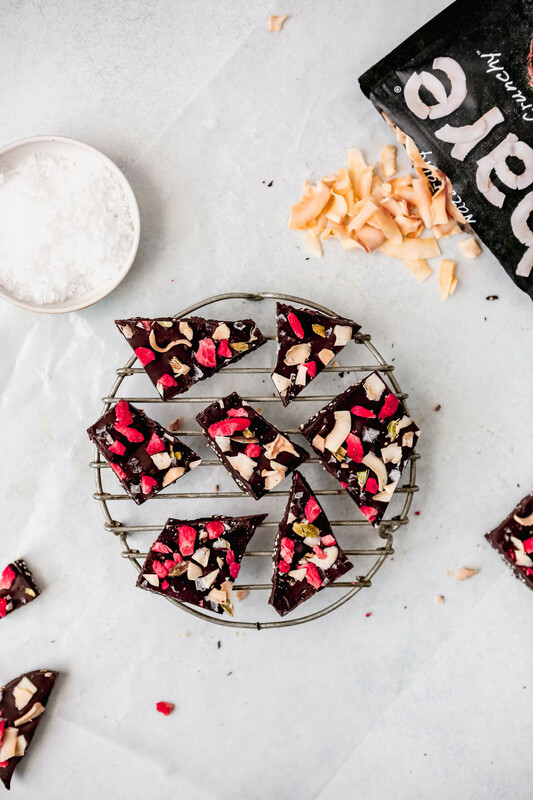 How do you make this coconut bark? The layering might look a bit complicated, but trust me, it’s so simple. It’s kind of like making scotcharoos. Kind of. Start by melting half of the dark chocolate in a double boiler (or microwave) until smooth. Stir in the millet and a splash of orange extract. Spread millet-chocolate mixture into a thin ¼-inch-thick layer and cool. Melt remaining half of chocolate with coconut oil until smooth, then stir in a splash of orange extract; let cool slightly. 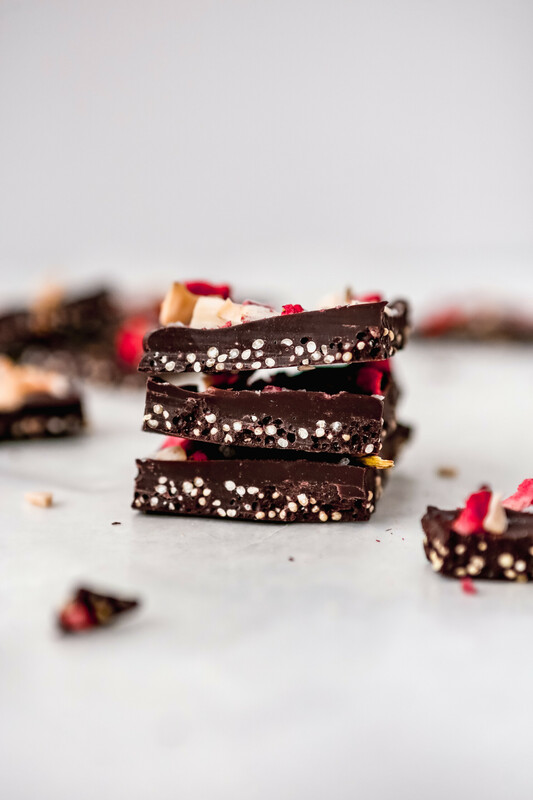 Spread chocolate layer over cooled chocolate-millet layer and sprinkle with toppings; let cool completely then break into pieces and enjoy! This recipe is made with simple ingredients and is gluten-free! If you or someone you’re cooking for follows a strict gluten-free diet, be sure to use certified gluten-free dark chocolate. 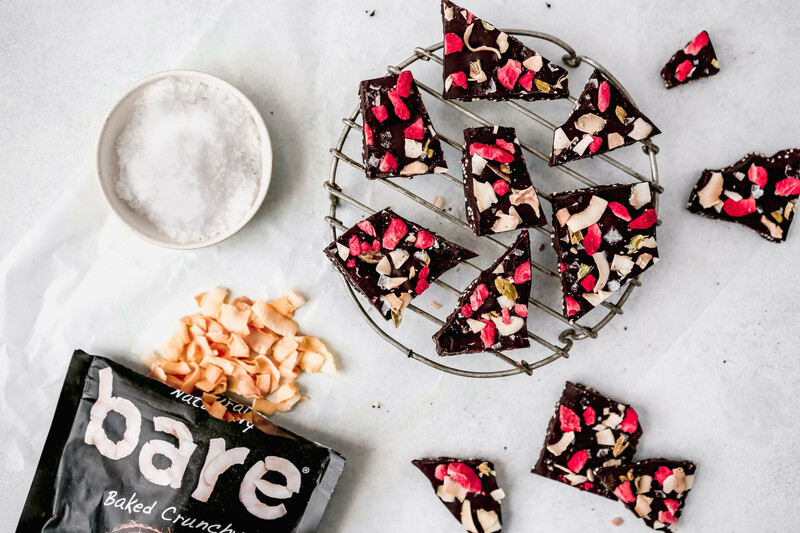 Smooth dark chocolate and crunchy millet combine to create the base of this crunchy coconut bark. 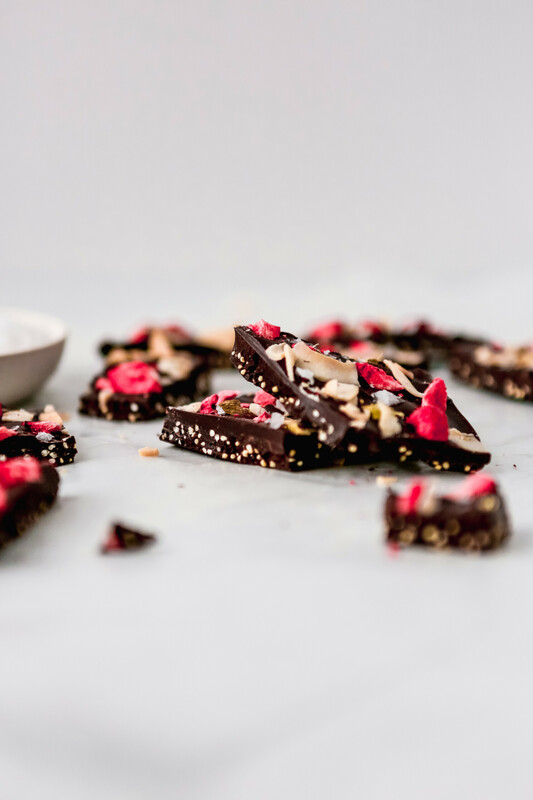 Topped with toasted coconut, freeze dried berries and sea salt, this bark is full of texture and flavor. Melt 4 ounces chocolate in a double boiler (a glass bowl set over a saucepan of simmering water) over medium until smooth. Off heat, stir in millet and ⅛ teaspoon orange extract; spread into a ¼-inch layer on wax paper and let cool. Melt remaining 4 ounces chocolate and coconut oil in a double boiler over medium heat until smooth. 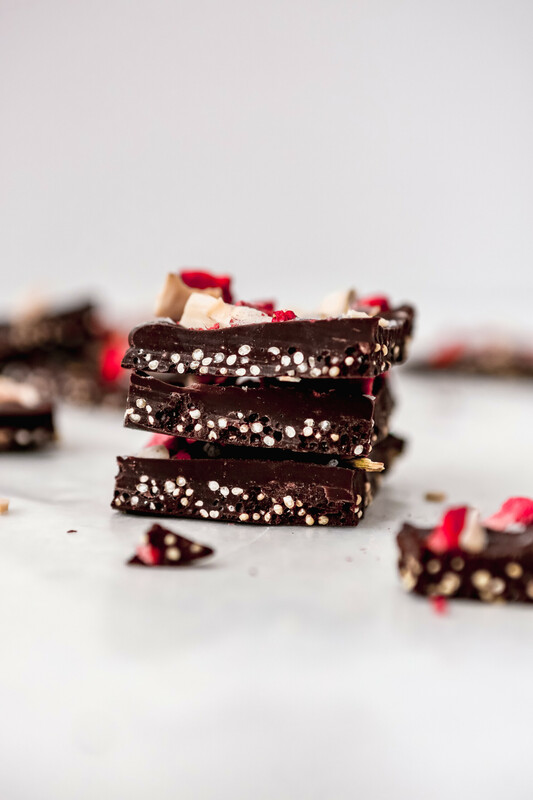 Off heat, stir in remaining ⅛ teaspoon extract and let cool 5 minutes; spread over cooled chocolate-millet layer and sprinkle with coconut chips, berries, cardamom pods, and sea salt (be generous with the salt). Let bark cool and set completely then cut or break into pieces. Store bark in an airtight container for up to 2 weeks or freeze for up to 2 months. Use certified vegan dark chocolate. This post was sponsored by Bare Snacks, as always the thoughts, opinions, recipe, photos, and content are all my own.